There seems to be no end to sports anime, understandable due to the enormous demand. For me who spends most of my time in front of the computer or with my books, watching sports anime is perhaps the only time I come remotely close to losing my usual placidity… I find myself exclaiming loudly when my favourite misses a shot (especially so when it's Kagami from Kuroko no Basuke), a mild reaction compared to my nonstop under-the-breath feverish praying muttering while the anime slow motions through the pre-shot sequence. Not unlike real-life matches, watching sports anime gets my heart doki-doki. One recent weekend, I sat down and caught up with Yowamushi Pedal's latest episodes. As you can tell from the name, a lot of pedaling is involved. Indeed, I'm talking about cycling! I am surprised that many people I know have not caught YowaPeda fever yet, as I personally feel it is a very addictive series. In YowaPeda's case, one wins by reaching the finishing line first, and instead of worrying during slow motion sequences, the entire race turns into one jittery nail-biting session for me as the cyclists swerve around corners and climb mountains… Bless my poor nerves! 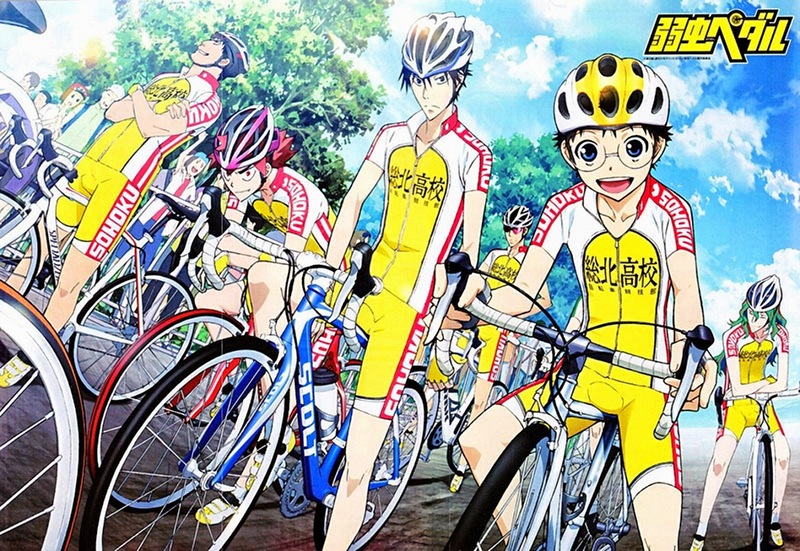 YowaPeda is a relatively new anime series (it first aired on October last year). However, the manga it is based on in fact begun serialization in 2008 and as of right now has 33 tankobans published. It revolves around three high school freshmen who join the Souhoku High Bicycle Club. Naruko Shoukichi is another freshman, a sprinter cyclist with a huge competitive streak. 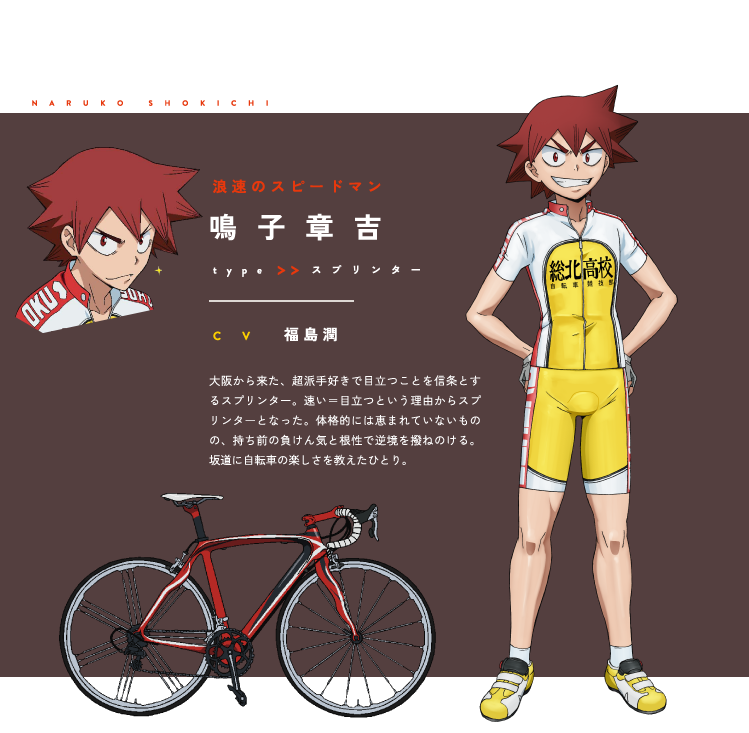 Just like his appearance, Naruko loves things that makes him stand out, from his red bike to his outgoing nature. Naruko is my personal favorite as he feels very brotherly. 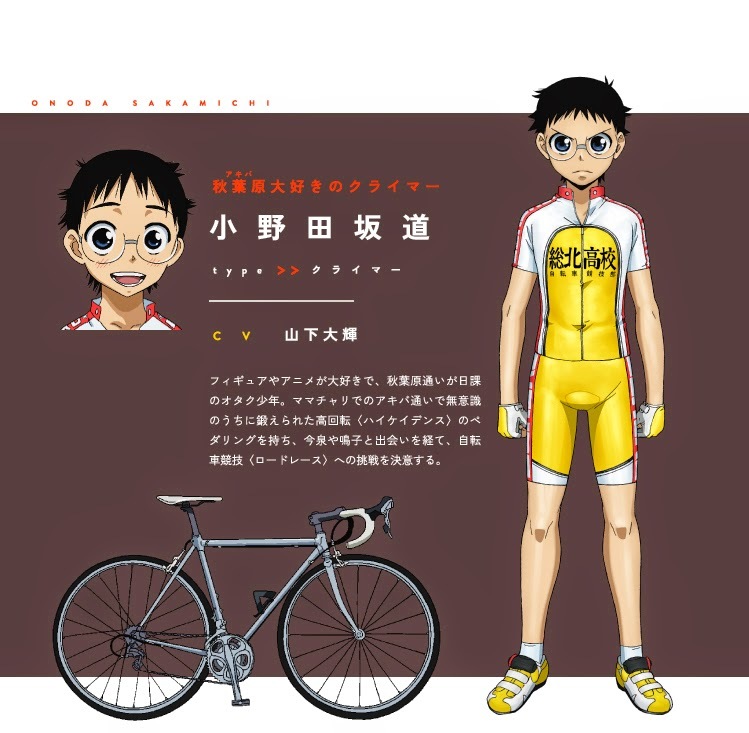 He takes very good care of his younger brothers (which explains why he carries candies around) and even Onoda, especially when he practically taught Onoda all the basics of cycling when he first started. 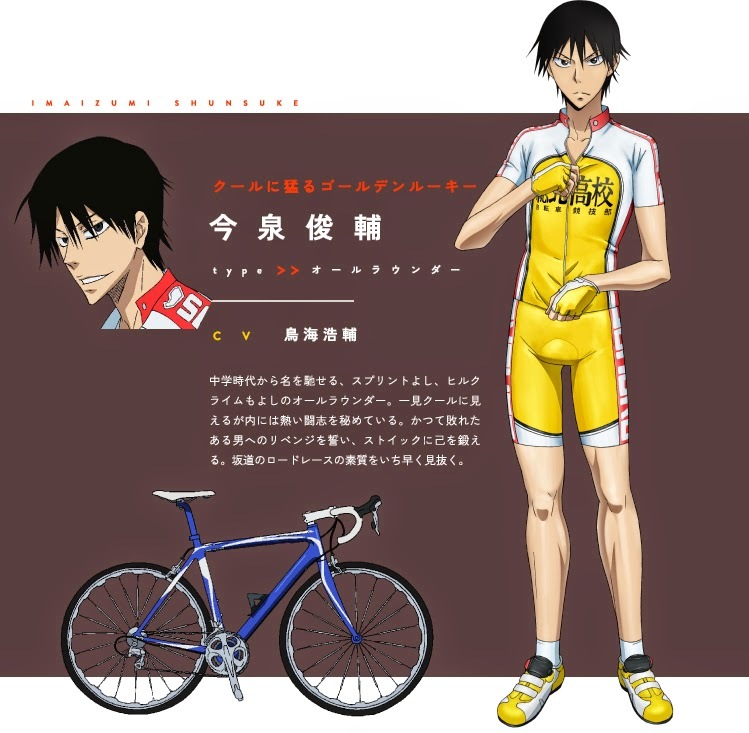 Imaizumi Shunsuke is a freshman as well and he was the one that ignited Onoda's passion for cycling. He is almost the opposite of Naruko, always reticent and expressionless. However, this does not stop him from amassing a legion of fangirls (me being one of them)! I find Imaizumi to be quite adorable despite his seriousness. Perhaps it's his knack of doing unexpected things, such as feeling embarrassed at watching Onoda's anime, or responding to Naruko's taunts to compete. Most of all, I love his casual clothes! He wears Usagi brand t-shirts which have a prominent bunny print and it amuses me to see it matched with his stoic face. Ahh~ Now I feel like bringing my own bicycle out for a long cruise by the seaside~ Of course, my bicycle resembles a mamachari more than a road racer! Are there any anime that incite you to start doing something or even pick up something new? 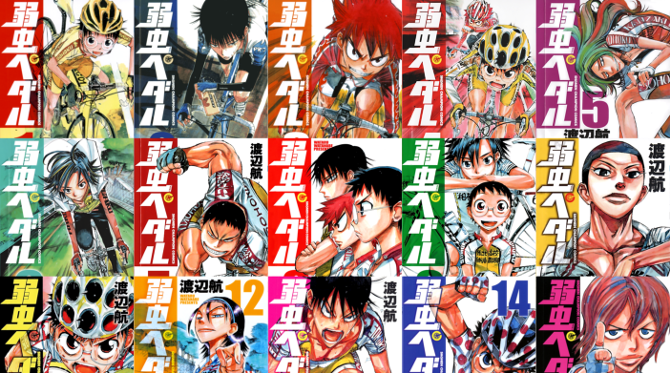 No Comment to " Ongoing anime: Yowamushi Pedal "